There were several reasons why last summer I decided to sign up and run the Miami Half Marathon. It was partly due to wanting to expand my horizons by running races I have not done before, as well as due to the attraction of Miami being a fun, vibrant city with very mild, enjoyable winters. However, the biggest reason was that I have a lot of family who lives there, including a few cousins who had completed this race in recent years and who were eager for us to be able to run it together in 2019. Right away, on the first day of the Expo (Friday), I knew I had made the right decision signing up for this race. Getting to the Expo from where we were staying in the Brickell area of Miami was easy and convenient. We walked a couple of blocks to the Metromover station, a free, elevated light rail service that operates seven days a weeks in the Downtown and Brickell area. We used the Metromover to connect us to the Miami Trolley, also free, which then put us literally across the street from the Race Expo being held at the Mana Wynwood Convention Center. After arriving and meeting fellow BibRave Pro Lisa, I went through the VIP packet pickup process and was helped right away by the Expo staff. They promptly corrected an issue with my original bib and corral assignment, and allowed me to exchange my t-shirt size from large to medium given that the large turned out to be too big. I then proceeded to enjoy what I feel has been the best Expo I've ever attended. There was a large variety of vendors, carrying plenty of colorful and interesting styles of merchandise. There were also many booths with representatives of races from all over Latin America, such as Cuba, Colombia, Mexico, and Costa Rica. On top of that, there were plenty of other fun aspects we experienced, such as a giant floor map of the course for marathon and half marathon routes, and a group of samba/carnival dancers and drummers who made their way throughout the Expo floor in full carnival style in the middle of the afternoon. After having a blast at the Expo, we moved on to walk the surrounding streets in the Wynwood area. There are a lot of free art galleries, museums, food trucks, restaurants, and entertainment for all. On race morning, we took a short Uber ride to meet one of my cousins who rented an Airbnb which was conveniently located only about a mile from the start line and corrals in front of the American Airlines Arena at the corner of Biscayne Blvd. and 8th Street. In our group of 4, we each had been assigned to different corrals, so we decided to simply slide to the furthest one back to be able to start and run together. We were at the corral a little bit longer than the expected release time for it due to a delay from the City of Miami police giving the race director the clearance to start the race. But with the great company and fun atmosphere all around us, the time flew by and we were all joking and happy once we started moving and crossed the start. Within the first mile, the course went onto the MacArthur Causeway and began to cross the beautiful Biscayne Bay, so literally from the beginning, the race was extremely enjoyable with awesome views and plenty of space and room to run on despite there being over 20,000 runners combined between the full and half marathon races. Not once did I feel that that there were too many runners around me or found it difficult to hit the pace and stride that I wanted to be in. Before long we had crossed Biscayne Bay and entered into South Beach, with streets lined with colorful buildings and tall palm trees everywhere. The course was very well-marked and supported from beginning to end. There were plenty of hydration stations, port-a-potties, and medical tents throughout, always full of eager and friendly volunteers cheering us on. The weather was not optimal for racing as it was humid and in the upper 60s (68 or so) at the start. However, I didn't have a problem with that as my goal for this race was to just run with my cousins, enjoy the scenery of the course, and not worry about pace or time. There was also enough of a cool breeze/wind to truly make things quite comfortable and enjoyable for me all the way to the finish line. The great majority of the course was flat and fast. There were a number of slight inclines with the bridges crossing Biscayne Bay going to and coming back from Miami Beach, but truly nothing to worry about at all. Along the course there were a number of bands playing music and plenty of people cheering runners on, in particular over the last couple of miles and all the way to the finish. Even though the finish line chute had a lot of volunteers handing out water and the gorgeous medals, we experienced a back-up of runners in front of us after we had finished and were in the chute and on our way to the food and stretching area. Our group reached out to the race administration about this issue and they indicated that we apparently finished at a moment in which there were inadvertently a more volunteers at the full marathon finisher’s chute than at the half marathon’s side, and that created a logjam on our side. Obviously this can be frustrating when you have just finished running a half marathon, but now that the race organizers are aware of this occurrence, I'm confident they'll plan accordingly and make the necessary adjustments for next year's race. Once we had gotten through the food and stretching area, we were treated to the largest post-race party I've ever seen, led by the 13th Army Band, playing awesome salsa music to the delight of the big crowds of finishers, friends, and family. Within 24-48 hours, not only were the official results posted in the Athlinks website (and emailed by race management), but also amazing, FREE (yes, free! ), high-resolution race photos included alongside them and ready to download---talk about huge value for your money! In summary, I absolutely loved this race. It is truly an enjoyable event from beginning to end, so much so that I have already decided to return in 2020 and experience it all over again. This was my first time racing in the Rock 'n' Roll series. I had a special motivation to participate in this well-known event, as I lived in San Antonio many years ago and still have both family and friends there. San Antonio also has a particular charm to it and well-known hospitality that attracts visitors and tourists not only nationally but internationally as well, and it was no different for me when I decided to opt-in and register. The online registration process was smooth through a quick, easy-to-complete form and I received an email receipt within seconds of completing the process. The packet pickup and expo was held at the Henry Gonzalez Convention Center in downtown San Antonio, a very large facility. While there was quite a bit of traffic, we were able to use a parking garage that is conveniently located directly across the street from the convention center and paid about $10 to park there. The process of picking up the bib was extremely easy and quick and took just a few minutes. The staff handling the process was particularly friendly, accommodating, and professional. For example, when I picked up my shirt (a nice gray tech t-shirt), the Large size seemed to be a bit too big so I asked if I could try it on and confirm the fit. They said that would not be a problem and immediately exchanged it for a size Medium after I confirmed the Large did not fit me right. I was also able to easily correct my corral assignment when I noticed by checking my bib that I had been assigned one that wasn't matching my projected time. The start line and corrals for both the marathon and the half marathon were located at the corner of Alamo and Market streets in downtown, just a block or so from the main gathering area for runners between Hemisfair Park and the Convention Center. I felt this area was perfect as it is quite spacious and was able to easily and comfortably accomodate the thousands of us who were participating. There were plenty of bathroom and port-a-potties located in various spots around the park; lines were short and moving quickly. Race organizers also set out tables with water and electrolytes in this waiting area for anyone needing pre-race hydration, and I noticed many people were welcoming that and taking advantage of it to make sure they were starting as ready as possible. Climate at start time was about as comfortable as it can be with temps in the low 50s with little to no wind. About 30 minutes prior to the start I took off the light jacket I had on before turning in my gear bag and just stayed with the singlet I had on, and didn't feel like I was too cold while waiting in the corrals. I felt that continued to be the case all the way to the finish line, although there were a couple of people who told me that it was slightly warm for their preference towards the end of the race (half marathon). 1 - The entertainment provided along the course primarily by bands playing all kinds of music such as rock, country, and mariachi. I was beyond impressed and thoroughly enjoyed the segment of road which I estimate to have been about half a mile or so, lined with several mariachi groups enthusiastically playing and signing. 2 - The well-spaced, staffed, and stocked hydration stations, in particular the ones at miles 5+ and 9, in which they handed out Science In Sport gels. Even though I was carrying my own nutrition as a backup, I used those gels and really liked them (orange flavor). Can't say enough about the enthusiastic and helpful support provided by all the volunteers I saw and greeted in each one of the stations; it simply makes for a very enjoyable experience to have people like that helping and cheering you on along the way. The great majority of the course was flat and fast, although there were a few rolling hills towards the back end of the half, around mile 11 or so. I personally enjoy rolling hills as I feel that when I get to the top of one and come out on the other side I will gain momentum on the downhill side and pick up some impulse and speed. If you have included some hill training in your workouts, you should be able to handle this course without a problem and shouldn't worry about it at all. A big course highlight for me was going through the Blue Mile area and Breckenridge park, both for its calming peace and beauty as well as the meaningful memories of those military veterans who gave up their lives serving our country. The finish line had plenty of volunteers handing out medals, water, and electrolyte drinks, and was quite wide with plenty of room for runners to walk or greet friends and family on the sides. The medal for the half has a neat and colorful design of an art structure of a large red ribbon which is located right at the start line and was neat to see on race morning. The post-race food and refreshments provided were outstanding in my opinion. In conclusion, I found this to be a quite an enjoyable race from beginning to end, and would say that its top aspects are the organization, support, and entertainment. The start and finish lines, all the various music bands along the course, and the well marked, stocked, and staffed hydration and aid stations along the way all send the message loud and clear that this is a professional, well-run event inside and out. Disclaimer: I received free entry to the North Olympic Discovery Half Marathon as part of being a BibRave Pro. Learn more about becoming a BibRave Pro by going to https://www.bibrave.com/bibravepro. This race is held in Port Angeles, Washington. Port Angeles is what I would describe as a quiet, postcard-perfect town, located on the northern edge of Washington state's Olympic Peninsula and along the shores of the Strait of Juan de Fuca. Everywhere you look, Port Angeles is surrounded by great views, whether it is thick and tall pine forests, snow-capped mountains, or blue ocean. If you are looking for a peaceful race destination without large crowds and to connect with nature, then Port Angeles is probably a great option for you. A smooth online process through a quick, easy-to-complete form. Received an email receipt within seconds of completing the process. The packet pickup and expo was held at a medium-size waterfront hotel, the Red Lion, which is adjacent to the race finish line and one block away from the Port Angeles town center. The process of picking up my bib was extremely easy and quick and took just a few minutes. The staff handling the process was very friendly and professional. Included in the packet for participants in the full and half marathon events was an OUTSTANDING long-sleeve, 1/4 zip runner's top of what I'll call a salmon color. It has a nice zipped pocket on one of its sides that is big enough to fit an ID, a key, and perhaps a gel or two as well. It also has the race logo on the left upper chest and another one on the back. I found this top to be extremely convenient as it helped me stay warm on race morning during my walk to the shuttle bus that took us to the race start line as well as during the first couple of miles of the race until I warmed up sufficiently. It is the type of gear I value as I know that I will use it for a long time, even in occassions when I am not running. Kudos to the race organizers for including it on the race packet. The expo itself is quite small, with aproximately 15-20 booths, most of them of representatives from other racing events in the Pacific Northwest area. The start line for the half marathon was located a few miles away in the town of Sequim. The race provided free shuttles to take all participants there, leaving from the Port Angeles Town Center every few minutes as they filled up (6:45am to 7:30am for the 8:30am start). Participants also had the option of driving their own cars to the start line in Sequim, then riding a free shuttle provided by the race after the finish. I feel this was also quite a flexible feature provided by the race organizers that showed their efforts in making things easy and convenient for participants. The start line in Sequim was at a large soccer field, with more than plenty of room to fit everyone comfortably. One one of the sides of the field there was a long block of port-a-potties to handle all the runners in hand; I didn't see or notice any particularly long lines on any of them at any one point while we waited for the start. In addition, there were a couple of tables with water and electrolytes for anyone needing pre-race hydration as well as a local high-school band playing awesome music pumping us up and keeping us entertained while we waited for the 8:30am start. Climate on race day was optimal for racing. Temperatures were in the low 50s with just a slight wind at start time. There was a threat of possible rain in the air, but it held off at least for the first couple of hours of the race. After I finished (around 10:45am), it started drizzling and the wind also picked up, so conditions deteriorated a bit at that point. 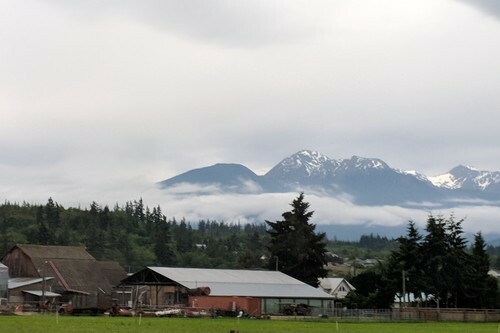 The bulk of the race course followed the Olympic Discovery Trail through rural farm lands and amazing views of the Olympic Mountains. Most of the trail is paved with asphalt and surrounded by trees on both sides offering plenty of shade and protection from the sun. There were plenty of rolling hills along the first 8 miles or so of the course, but perhaps with only a couple of exceptions, most of them were short and not too steep; in my opinion just slight elevation changes that add variety to the challenge and make it fun. If you have included some hill training in your workouts, you should be able to handle this course without a problem and shouldn't worry about it. The hydration/support stations were plentiful along the way and fairly evenly spaced. They all had a variety of items such as orange slices and gels in addition to water and electrolytes. They all also had plenty of volunteers staffing them with a friendly and cheerful attitude. At around miles 9-10, the course reached the beautiful coastline and turned basically flat the rest of the way, following the shore all the way until the finish line. This helped me get into a really good pace and rythm and I was able to make my last mile the fastest one for the day. The finish line had plenty of volunteers handing out medals, water, and electrolytes, and was quite wide with plenty of room for runners to walk or greet friends and family on the sides. 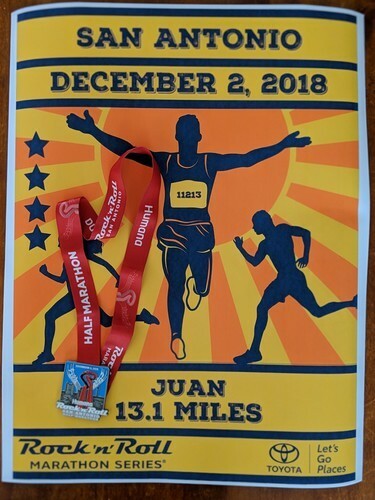 The medal has an image of colorful painting of a group of runners crossing one of the beatiful bridges found along the course, with the snow-capped mountains and sun behind them. The post-race food and refreshments included a variety of fruit, muffins, yogurt, granola, chocolate milk, and beer. I found this to be an extremely enjoyable race from beginning to end, and feel that out of all the positives, the top one is the scenery and beauty of its course. It is definitely a race I'd recommend to anyone who hasn't had an opportunity to experience it yet. The packet pickup and expo was held at a small-medium size facility in La Villita, near the convention center in downtown San Antonio. La Villita is a quaint and picturesque area full of small shops and restaurants that is actually fairly popular with tourists and local alike. The building in which the packet pickup is held is at the west end of La Villita, at the corner of Presa St. and Villita St. The process of picking up my bib and shirt was extremely easy and quick, took less than 2 minutes. The staff handling the process was very friendly and professional. When they gave me my shirt, I noticed that it was much larger than I'm used to on a size L. They allowed me to try it on and exchange it for a Medium size that fit much better. Big kudos to them, that courtesy and gesture is more than appreciated! The race swag consisted of an AWESOME looking medal and red tech shirt combo, both included the shields/symbols that are representative of the various cultures of individuals who fought at the battle of the Alamo in 1836. Both are keepers no doubt. The start line was conveniently located on Alamo St. immediately adjacent to the Hemisfair Park grounds, which are quite spacious and comfortable, with plenty of room and areas such as benches and wide walkways to stretch and relax prior to the race. There were also plenty of port-a-potties to handle all the runners in hand; I didn't see or notice any particularly long lines on any of them. This event catered to most runners out there (with the exception of those looking for ultras) offering distances ranging from a 5K all the way to the full 26.2 miles marathon. Climate on race day was not optimal for racing, but as we all know, that's completely out of the control of everyone, including the race director. At start, temps were in the high 60s and there was high humidity with the threat of rain looming over the race. Despite that, to me it didn't feel bad and I was able to run my race without a struggle or being uncomfortable. A sweet & sour area for this race. The course itself I absolutely loved and is what I would consider, by far, the #1 reason to run this race---an interesting, varied, and scenic course that never got dull or boring. It winds through nice cobblestone streets in downtown, neighborhoods full of beautiful Victorian-homes, historic Spanish missions, and well-developed trails all along the San Antonio River. It is such a nice course that I did something I had never done before, and that was to stop to take photos SEVERAL times throughout the course to just capture the memories. I have been running races for about 18 years now, and with the exception of the Marine Corps Marathon Course, I don't think I have enjoyed a course as much as I enjoyed this one at the Alamo 13.1. That being said, the support along the course, primarily at the hydration stations, was disappointing. There were at least 2 stations where there were only 1 or 2 volunteers, with no water or electrolyte drink ready for the runners to grab. Keep in mind that I wasn't a back-of-the-pack runner, more mid-pack as I was running approximately a 9:30 minutes/mile pace. Imagine the scene as you are approaching the table and notice that there are literally 6-7 people completely stopped, waiting for the 1-2 volunteers who are trying to pour the drink into the cups and hand them over because there is no one else to help them. I distinctly remember this being the case with the hydration station around mile 8. I didn't want water, just electrolyte, and there was no line for that container, so I literally had to grab an empty cup, pour myself the electrolyte from the container, and keep going. I went into the race's Facebook page and read quite a few reviews there which addressed the same issue. I did find one comment/reply from the race organization on those Facebook reviews which indicates that apparently a couple of days prior to the race, a group of 40 volunteers they were counting on to help dropped out, so they were severely understaffed and it clearly had an impact on race day. I personally feel that they will learn from that experience and will do whatever it takes to get it corrected for next year and in the future. The finish line had plenty of volunteers handing out medals and water and was quite wide with plenty of room for runners to walk or greet friends and family on the sides. The medal is a large, chocolate bar unwrapped at the top that makes it appear that you're about to eat it, and it's a neat, unique design---definitely a keeper. The post-race food was, as expected, all themed around chocolate, with delicious dark hot chocolate, marshmallows, etc. It truly is good, quality chocolate believe me. I consider myself a chocolate-snob and theirs passes the test with flying colors. I enjoyed literally just about every aspect of this race with the lone exception being the issue with the hydration stations. Other than that, there wasn't a component that I felt was not done professionally and with thought behind it, and feel that the race organizers will improve on it on next year, and thus would definitely considering signing up for it again in 2019. The registration for this race is easily done online through an easy-to-understand page and form. Cost is reasonable and in-line with other half-marathons. 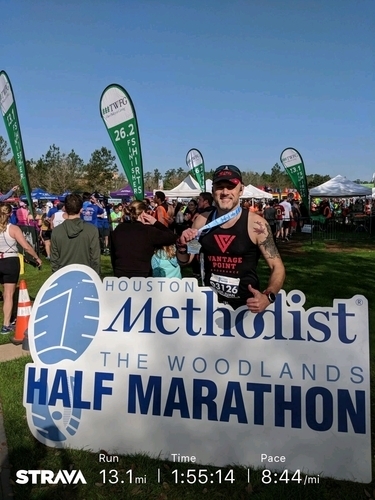 The packet pickup and expo was held from 10:30am-8:00pm at the Marriott Hotel in The Woodlands Waterway, on the day before the race (Friday, as this race is always on a Saturday). I went there after work, parked with no problems at the mall directly across the street and walked over. After entering the hall where the pickup is held, I checked in at the table with the signs for my bib number, they checked and verified my ID, and gave me my bib. I then walked to an adjacent set of tables to get my choice of either a hat or visor with the race logo. I looked at both and opted for the visor. Neither design or color was bad (dark blue with white lettering), but they look quite similar to prior years' hats and somewhat bland, not all that great or appealing--just 'meh'. After picking up the visor, I walked through the snake-style hallways of booths in literally less than 5 minutes. I didn't see a single table or booth that came across as interesting enough to stop or purchase anything, but I guess if you were needing some gear or nutrition, they had it. It did feel though as if this expo not only had a lot less people (runners) attending, but also less booths/vendors than in years past (I have participated in this race 3 times before). I later exchanged texts with a friend who indicated noticing the same thing. Swag: The main swag item was a finisher's t-shirt. It is green and made out of a nice, comfortable blend material, with an ok design on it. Again, not bad, but nothing to write home about. Start Line: I parked for free at the neaby mall parking lot, approximately 2-3 blocks and easy walk from the start. The start line was conveniently adjacent to a large and spacious area, Tom Green Park and the Cynthia Woods Mitchell Pavillion, a popular entertainment facility for concerts, etc. The corrals had staggered closure times and were well setup, controlled, and accessed. Weather: I've read and heard people complaining about the weather for this race, but I have been fortunate that each year in which I've run it, the weather has been perfect, including this year. Temps at start time of 7am were in the low 50s with a bit of sun, little or no wind. I ran on a tank top and felt that the weather couldn't have been any better for racing. The course resembles a rectangle that goes out and starts turning back to the point of origin around mile 7. It is mostly pancake flat, with some segments of asphalt and some concrete, with a few declines here and there and just a short incline or two. From the very start I ran a pace better than I was targeting, all the way to the end and PR'd by almost 4 minutes (and prior to a few months ago, I had also set my PR here back in 2016), so this is definitely a fast course for me. There are tons of trees on both sides of the roads everywhere you go to in The Woodlands, so that is the view you have along most of the way---trees. The hydration stations were as indicated on the course map, well setup, organized, and staffed with volunteers. The finish line had plenty of volunteers handing out medals and water and was quite wide with plenty of room for runners to walk or greet friends and family on the sides. The medal design was similar to how I felt about the hats/visor---not bad, but not all that great either. The post-race food was good, with plenty of fruit, breakfast tacos, chik-fil-a, and chocolate milk. The post race is held at an ample park area next to the finish line, with plenty of room to relax and celebrate with friends and family. While I did enjoy doing this race again this year, in particular being able to PR, I am not sure I will run it again next year because I've already done it a few times and don't feel there isn't that much new or appealing with it anymore for me. That doesn't mean I wouldn't run it again or recommend it to someone else, because it is a nice event done professionally; it's just that I would probably run and experience other races and locations instead for the time being.